Leishmaniasis, one of the most important parasitic disease transmitted by Phlebotominae vectors is wide-spread, and has different epidemiological and clinical features. The disease is endemic in more than 98 countries on four continents, and an estimated 700,000 to 1 million new cases and 20,000 to 30,000 deaths occur annually across the world,. Visceral leishmaniasis (VL) is one of the most important clinical form of leishmaniasis in humans as well as canines. The causal agent of the disease belongs to the group of Leishmania donovani complex (Order Kinetoplastida), which is transmitted by different species of female sandflies,,,. The disease can be fatal if left untreated, and even with the availability of treatment, the mortality rate reported varies from 10 to 20%. Leishmania infantum is the main causative agent of VL in humans and dogs in Mediterranean region. Recently, L. tropica and L. major have been reported in some cases, as principal agents of VL in human,, and domestic dogs,. Visceral leishmaniasis is endemic in several parts of Iran including Ardabil, East Azerbayjan, Fars, Bushehr, Kerman and Qom and North Khorasan provinces,. Though, it has been reported to exist in sporadic form in other areas of Iran,. The domestic and wild dogs are the most important reservoirs for VL in Iran,,,,. Domestic dogs and wild canines such as foxes, jackals and wolves are infected with L. infantum, which seem to play an important role in the wild cycle of the disease in mountainous areas,,,. Determining the prevalence of canine VL (CVL) in endemic areas is necessary for controlling zoonotic visceral leishmaniasis (ZVL),. The prevalence of L. infantum infection varies from 2.6 to 26.6% in different parts of the world. The clinical symptoms of CVL vary from asymptomatic forms to restricted and deadly infection,. Moreover, the incubation period lasts from several months to several years, depending on the virulence of the parasite and host genetic characteristics. Different serological and molecular methods are used to detect L. infantum in humans and reservoirs,. The easiest and most cost-effective detection method in this regard is direct agglutination test (DAT) which has high sensitivity and specificity and is widely used in developing countries,. Domestic dogs are most important reservoirs of the disease, which might not show any symptoms for a long time and relative resistance to antileishmanial treatments can easily distribute VL in different regions,,. Therefore, one of the best ways of preventing infection to humans is rapid identification and control of the reservoir population, including infected domestic dogs and wild canines. Hence, determining the disease status in animal reservoirs and their control can play a significant role in preventing VL spread to humans,. Given the plethora of studies conducted on domestic and wildlife reservoirs in different areas of Iran, it is necessary to estimate the prevalence of L. infantum infections in different reservoirs in endemic and non-endemic areas of Iran. This study was an attempt to review the earlier studies of VL caused by L. infantum carried out on animal reservoir hosts using different methods in Iran. This study systematically searched all the earlier published studies, reports and documentations related to VL that used parasitological (microscopy and culture), serological (DAT) and molecular methods for its identification/diagnosis. International databases such as Cochrane, MEDLINE/PubMed, Google Scholar, Science Direct, Scopus, Web of Science, Veterinary information network, VetMed Resource, Zoological Records, Biological Abstracts, CAB Abstracts as well Iran's databases (for Persian articles) including Iran Medex, Scientific Information Database (SID) and Magiran were searched with no time limitation. The results were qualitatively summarized in order to find out any precise information relating to the purpose of the study. Initially, all the article titles were entered into a reference manager software, namely End Note. After deletion of the duplicate cases, they were assorted for initial screening. In the first stage, these article titles were reviewed. Afterward, all the articles that were irrelevant to the objectives of the study were removed from the primary databank. Next, two persons scrutinized the titles and abstracts; and the articles that were selected by both the persons were finalized for subsequent analysis [Figure 1]. Figure 1: Flow chart demonstrating database search, screening and selection of studies. The following words and phrases were used in order to search the articles: “visceral leishmaniasis in Iran” in the titles and “canine visceral leishmaniasis in Iran” or “feline visceral leishmaniasis” or “accidental reservoir hosts of visceral leishmaniasis in Iran” in subtitles. Other key words included visceral leishmaniasis, kala-azar, canine visceral leishmaniasis, leishmaniasis in domestic and wild canine, leishmaniasis in dogs, foxes, wolves, jackals, and rodents, L. infantum in dogs and canines. All the studies were in the form of a M. Sc., or Ph.D. theses and research projects, whose results had been published as research articles in prestigious journals. 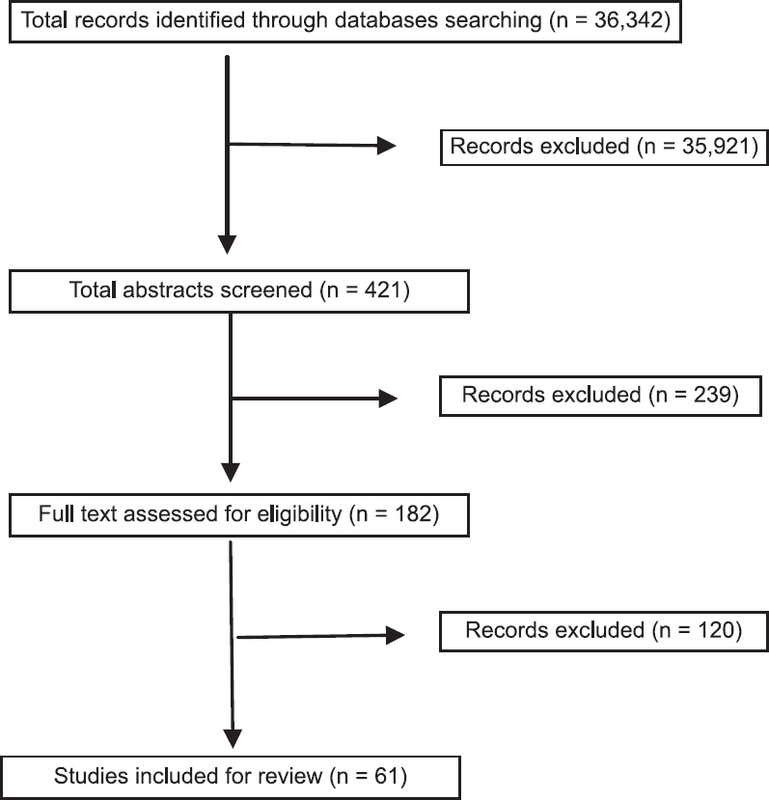 All of the compiled articles in this review study had met the rules of publishing a scientific article in the journals. The exclusion criteria consisted of the absence of the issue number and approval letter by the university. Data were summarized based on individual provinces, endemic and non-endemic areas, as well as two groups of wild and domestic reservoirs. The prevalence of the CVL disease, based on the years and different regions at the provincial level, was developed using the Arc GIS 10.4.1 software, and distribution maps were generated based on the type of reservoirs [Figure 2]. SPSS ver. 23 and quantitative statistical tests, such as chi-square analysis and correlation analysis were used in order to investigate the status of CVL among different reservoirs as well as the relationship between age and gender. Moreover, all the diagnostic methods (molecular, serological and parasitological) were used in order to analyze the infection of the reservoirs. Figure 2: Distribution and prevalence rate of CVL in provinces of Iran (1982–2017). Out of all the databases searched from 1982 to 2017, only 61 articles/studies were found eligible for inclusion in this systematic review. These studies were carried out in 20 of the 31 provinces, and >38% of them were conducted in northwest of Iran (Ardabil province). The highest number of studies, i.e. 10 and 9 were conducted in 2011 and 2013, respectively [Figure 3]. The first study was conducted in 1982 in Mazandaran province (non-endemic area of VL) and the latest study was reported from Kerman province (endemic area) in 2017 [Table 1]. Figure 3: Frequency of studies carried out on CVL in Iran (1982–2017). In these studies, a total of 24,884 animals were examined, of which 94.23% were the owned pets and stray dogs and the remainders were other wild animals. Of all the dogs investigated, 90% were pets and sheep dogs and 10% of those were stray dogs. The infection rate with Leishmania parasites was 14.18% in the domestic dogs and 6.35% in wild canines [Table 2]. 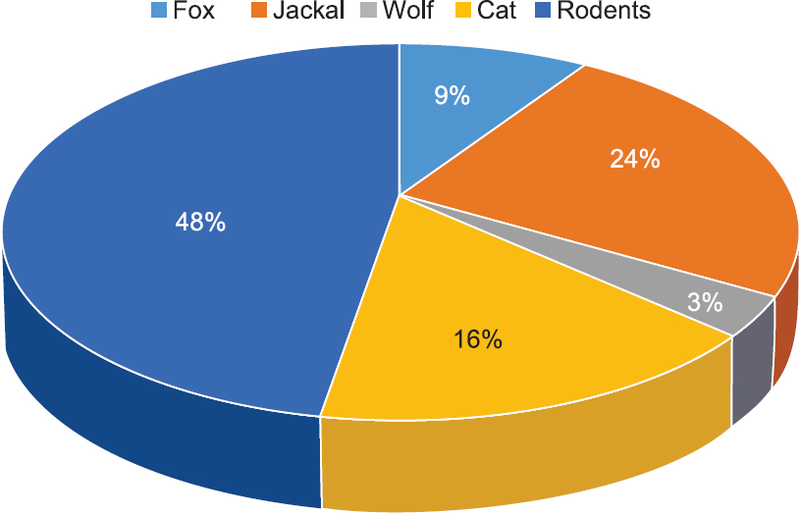 In total, 1434 cases of wildlife as reservoir hosts for VL have been investigated, in which the highest number of examined animals were rodents (48%) and the lowest were wolves (~3%) [Figure 4]. Analysis of L. infantum infection frequency in dogs according to different regions of the country shows that it was distributed mainly in 20 provinces of Iran, viz. Alborz, Ardabil, Bushehr, East Azarbaijan, Razavi Khorasan, Chaharmahal and Bakhtiari, Isfahan, Fars, Qom, Golestan, Hamadan, Kerman, Khuzestan, Kohgiluyeh and Boyer-Ahmad, Lorestan, Mazandaran, North Khorasan, Semnan, Sistan and Baluchestan and Tehran [Figure 5]. Figure 4: The percentage share of wildlife reservoirs in terms of CVL in Iran (1982–2017). 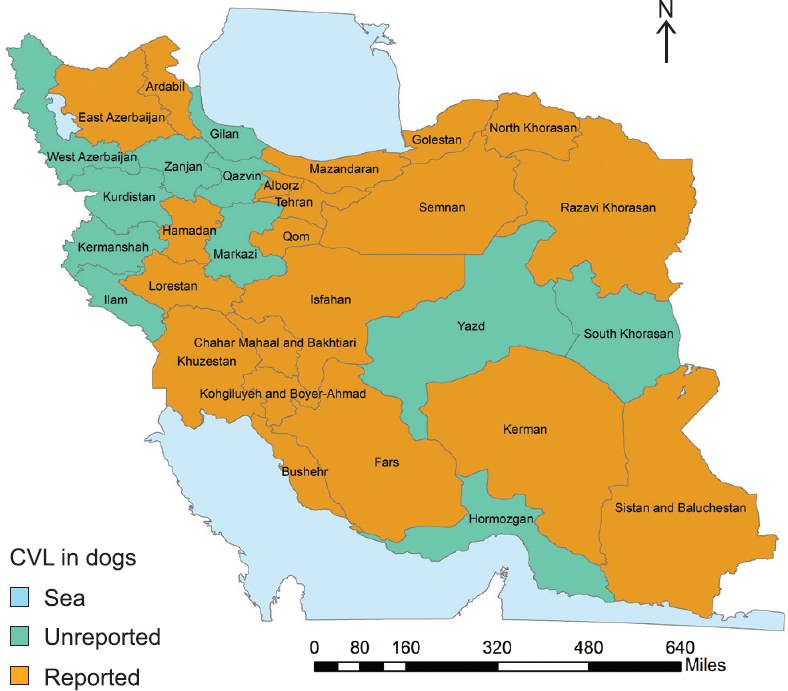 Figure 5: Geographical distribution of L. infantum infections in dogs, Iran 1982–2017. Infection with L. infantum in domestic cats (by DAT method) was reported from three provinces of Iran, namely Ardabil, East Azarbaijan, and Kerman, with the infection rates of 24.27, 23 and 6.70%, respectively,,. Fox infection was reported from four provinces of Iran— North Khorasan, Ardabil, East Azerbaijan and Bushehr. The mean infection rate reported (using serological and parasitological methods) was 20.5, 10.71, 5.2 and 15.55%, respectively in these provinces [Figure 6]. The infection in jackals (identified via serological methods) was reported from six provinces namely, East Azerbaijan (20%), Ardabil (23%), Mazandaran (5.5%), North Khorasan (11.66%), Chahar Mahal and Bakhtiari (5.26%) and Bushehr (15%). The infection rate was 7.70% in Ardabil province using parasitological method. Infection with L. infantum in rodents was only reported from northwest of Iran (Ardabil and East Azerbaijan provinces) [Figure 5]. Among the five species of rodents investigated, infection share/frequency was highest for Meriones persicus (69%) and lowest for Mesocricetus auratus (0.5%). The infection rate reported for Meriones persicus by using parasitological methods was 14.7%, for Cricetulus migratorius it was 7.2%, and for Mesocricetus auratus it was 75%; while no reports were observed for Mus musculus and Rattus norvegicus. Figure 6: Distribution of L. infantum infections among the studied animals, Iran 1982–2017—(a) Fox; (b) Cats; (c) Rodents; and (d) Jackals. Of the all domestic and wild reservoirs that were studied, L. infantum parasite was reported in 12.33% hosts using the molecular, serological and parasitological methods. The major diagnostic methods used in these studies included DAT (12.5%), ELISA (6.1%), PCR (1.7%), DIPESTIC rK39 (0.8%), IFA (0.1%) and parasitology (0.5 %). The infection rate of L. infantum in different reservoirs examined by serological and parasitological methods was 23% for cats, 12.52% for domestic dogs, 11.33% for rodents, 10.2% for wolves, 9.9% for foxes and 6.36% for jackals. Other than L. infantum parasite, L. tropica and L. donovani were also isolated from the reservoirs. Leishmania tropica has been isolated from dogs in the northwest, center, and northeast of Iran; from the jackals in northeastern Iran, and from foxes and wolves in northwest of Iran while L. donovani has been only reported in desert rodents in northwestern of Iran by using both serological and parasitological methods. Among endemic areas, the highest infection rate was reported from the Ardabil province (24%) and the lowest infection rate was reported from Bushehr province (9%), using all diagnostic methods. In non-endemic areas, the highest and lowest infection rates were reported from Golestan (32%) and Hamadan (4%) provinces, respectively. According to the included studies, the infection rate in CVL reservoirs varied from 6 to 24% in endemic areas and from 4 to 32% in non-endemic areas of Iran. Each year, >20,000 to 30,000 human deaths occur from VL in the world. The dogs and wild canines constitute the most important reservoirs for L. infantum in the old and new worlds,,. Determining the prevalence and rate of infection in different reservoirs can help in controlling ZVL. Various studies have shown that in the past decade, L. infantum was the most predominant Leishmania species for both VL and CVL in different parts of Iran,. It has been reported that dogs and wild canines including jackals, foxes and wolves are frequently infected with L. infantum in Iran,,,. Over the past 35 yr, about 61 studies have been carried out on domestic and wildlife reservoirs in different regions of Iran, especially endemic areas, all those point to the indispensable role of reservoirs in epidemiological aspects of VL. The first study in non-endemic areas of Iran was conducted in 1982 in Mazandaran province where the reported infection rate was 3%, while the most recent one was conducted in Sistan and Baluchestan province in 2014, with the reported infection rate of 15.4%, indicating the variability of the infection rate in different parts of the country. Among the endemic regions of Iran, the first study was conducted in 1993 in Ardabil province, where the infection rate was 14.8% by serological method. The most recent study was conducted in 2016, in the same province, and infection rate in dogs was found to be 32.6%, which represents an increase of reservoirs in this province. The comparison of the results of the infection prevalence in reservoirs, in both endemic and non-endemic regions shows that the percentage of reservoir infection is high in both the regions. Findings pertaining to the prevalence of VL in humans also show that >50% of human cases occur in the endemic areas of the northwest of Iran, which is consistent with the prevalence of reservoirs infection in northwest of Iran,,,,. The prevalence rate of CVL in Iran is higher in endemic areas than in non-endemic ones and varies from 4–32%. In northeastern Brazil, the infection rate of CVL was reported to be 3.95–5.31% in 2014; and in north Spain it was reported to be 28% by PCR method. Among various reservoirs in Iran, domestic dogs and jackals showed the highest rate of infection with L. infantum implying that dogs and jackals are respectively their main domestic and wild reservoir in Iran. Leishmania infantum was isolated from Cricetulus migratorius and Mesocricetus auratus, Two species of parasites, i.e. L. infantum and L. donovani were isolated and reported from the Meriones persicus. These results indicate that rodents should be considered in devising strategies for epidemiological control of VL in Iran. In a study conducted in Brazil, three parasites namely, L. donovani complex, L. mexicana complex and L. braziliensis were isolated and reported using molecular method,. In other areas, like Italy, Saudi Arabia and Venezuela, where human VL is active, natural infection of black rats with L. infantum and L. donovani and their role in preserving the disease has been reported in many studies,,. So far, three species of Leishmania parasites have been isolated and reported from wild and domestic reservoirs in Iran, 98% of which constitute/include L. infantum and L. tropica while L. donovani is rarely reported. This result shows that L. infantum is the main agent of CVL in Iran. In a WHO report also, L. infantum has been introduced as the main cause of Mediterranean VL in humans and reservoirs,. Leishmania parasites have also been isolated from domestic and wildlife reservoirs in other parts of the world. For instance, in Mexico, three species of parasites including L. mexicana (20.63%), L. infantum (6%) and L. braziliensis (7.52%) were isolated from the blood serum of dogs by ELISA method. The frequency of L. infantum infections in Mexico was less than that reported in Iran. In Spain, 28% of the studied animals were found to be infected with L. infantum by using PCR method. The infection rate was found to be 29% in foxes, 25% in wild cats, 50% in weasels, 30% in sages and 26% in gravels. As in Madrid, the L. infantum was isolated from 22.9% rabbits under investigation by rK39 method. These results indicate that L. infantum infection has a wide distribution in domestic and wild reservoirs in most of the regions of Iran. The first study in Iran was conducted on cats in 2010 in Fars and East Azerbaijan provinces and L. infantum was isolated from cats by molecular and parasitological methods. In Sao Paulo and Rio de Janeiro, Brazil L. infantum/chagasi was reported in domestic and wild cats,. In an another study, high seroprevalence rates have been reported in domestic cats (Felis catus) based on detection of anti-L. infantum antibodies, indicating that infected cats might play a potential role in the maintenance of L. infantum in the endemic areas of ZVL. This finding suggests that cats could play an important role in preserving VL in natural environments. The review indicates that CVL is endemic in various parts of Iran and domestic dogs are the main and potential reservoir hosts of the disease. Other carnivores, such as domestic cats and some species of desert rodents (Cricetulus migratorius, Mesocricetus auratus and Meriones persicus) seem to be playing a role in the maintenance of transmission cycle of L. infantum in the endemic areas of the disease. High infection rates of CVL among domestic dogs compared to other canines pose a potential transmission of the disease to humans. The status of other reservoir hosts, including domestic cats as well as domestic and wild rodents particularly in endemic areas could be helpful in controlling the expansion of the disease. Moreover, the status estimation of sandflies that feed on the blood from these infected reservoir—Hosts is also necessary to prevent the disease transmission. Due to the increasing trend of CVL in Iran, it is strongly recommended that comprehensive plans should be implemented in order to prevent and control this disease, especially in endemic areas. This study was approved and financially supported by the Tehran University of Medical Sciences (Project Nos: 96-01-160-34180; 94-02-27-29919; and 97-01-16037931). Alvar J, Velez ID, Bern C, Herrero M, Desjeux P, Cano J, et al. WHO leishmaniasis control team. 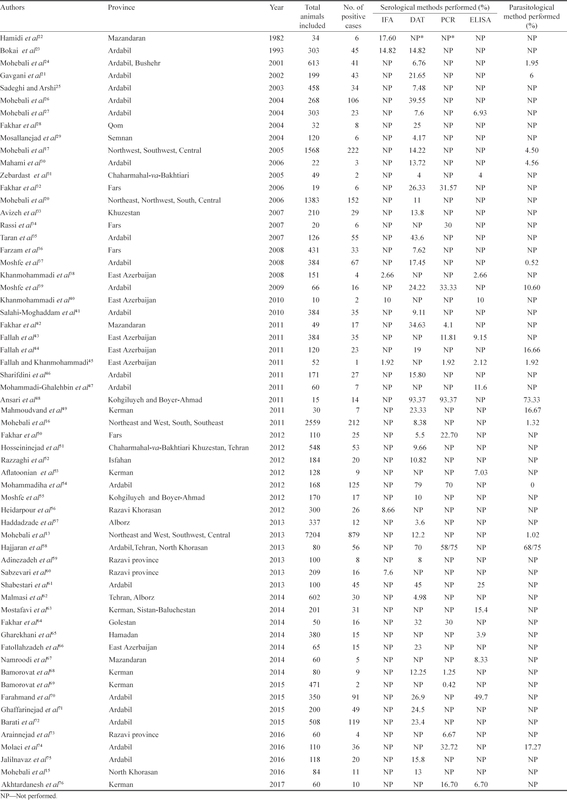 Leishmaniasis worldwide and global estimates of its incidence. PloS One 2012; 7(5): e35671. Control of leishmaniases. WHO Tech Rep Ser No. 793. Geneva: World Health Organization 2010. Collin S, Davidson R, Ritmeijer K, Keus K, Melaku Y, Kipngetich S, et al. Conflict and kala-azar: Determinants of adverse outcomes of kala-azar among patients in southern Sudan. Clin Infect Dis 2004; 38(5): 612–9. Cortes S, Vaz Y, Neves R, Maia C, Cardoso L, Campino L. Risk factors for canine leishmaniasis in an endemic Mediterranean region. Vet Parasitol 2012; 189(2–4): 189–96. da Silva AV, de Souza Cândido CD, de Pita Pereira D, Brazil RP, Carreira JC. The first record of American visceral leishmaniasis in domestic cats from Rio de Janeiro, Brazil. Acta Trop 2008; 105(1): 92–4. Del Río L, Chitimia L, Cubas A, Victoriano I, De la Rúa P, Gerrikagoitia X, et al. Evidence for widespread Leishmania infantum infection among wild carnivores in L. infantum periendemic northern Spain. Prev Vet Med 2014; 113(4): 430–5. Desjeux P. Leishmaniasis: Current situation and new perspectives. Comp Immunol Microbiol Infect Dis 2004; 27(5): 305–18. Jafari S, Hajiabdolbaghi M, Mohebali M, Hajjaran H, Hashemian H. Disseminated leishmaniasis caused by Leishmania tropica in HIV-positive patients in the Islamic Republic of Iran. East Mediterr Health J 2010; 16(3): 340–3. Alborzi A, Rasouli M, Shamsizadeh A. Leishmania tropicaisolated patient with visceral leishmaniasis in southern Iran. Am J Trop Med Hyg 2006; 74: 306–7. Shafiei R, Mohebali M, Akhoundi B, Galian MS, Kalantar F, Ashkan S, et al. Emergence of coinfection of visceral leishmaniasis in HIV-positive patients in northeast Iran: A preliminary study. Travel Med Infect Dis 2014; 12(2): 173–8. Badirzadeh A, Mohebali M, Sabzevari S, Ghafoori M, Arzamani K, Seyyedin M, et al. Case report:First coinfection report of mixed Leishmania infantum/Leishmania major and human immunodeficiency virus—Acquired immune deficiency syndrome: Report of a case of disseminated cutaneous leishmaniasis in Iran. Am J Trop Med Hyg 2018; 98(1): 122–5. Hajjaran H, Mohebali M, Zarei Z, Edrissian G. Leishmania tropica: Another etiological agent of canine visceral leishmaniasis in Iran. Iran J Public Health 2007; 36(1): 85–8. Mohebali M. Visceral leishmaniasis in Iran: Review of the epidemiological and clinical features. Iran J Parasitol 2013; 8(3): 348–58. Edrissian GH, Nadim A, Alborzi AV, Ardehali S. Visceral leishmaniasis: The Iranian experience. Arch Iran Med 1998; 1(1): 22–6. Mohebali M, Arzamani K, Zarei Z, Akhoundi B, Hajjaran H, Raeghi S, et al. Canine visceral leishmaniasis in wild canines (fox, jackal and wolf) in northeastern Iran using parasitological, serological, and molecular methods. J Arthropod Borne Dis 2016; 10(4): 538–45. Mohebali M, Edrissian GH, Shirzadi MR, Akhoundi B, Hajjaran H, Zarei Z, et al. 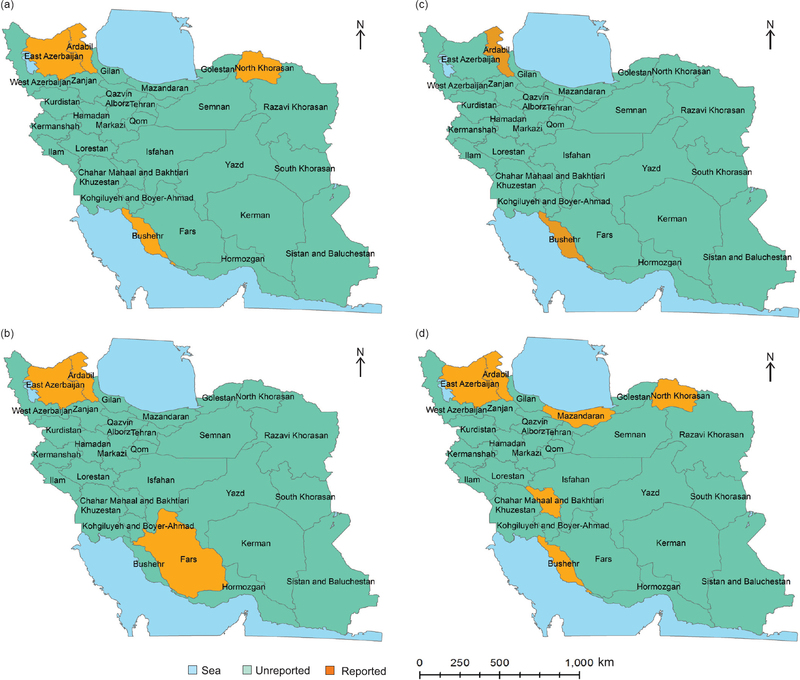 An observational study on the current distribution of visceral leishmaniasis in different geographical zones of Iran and implication to health policy. Travel Med Infect Dis 2011; 9(2): 67–74. Mohebali M, Hajjaran H, Hamzavi Y, Mobedi I, Arshi S, Zarei Z, et al. Epidemiological aspects of canine visceral leishmaniosis in the Islamic Republic of Iran. Vet Parasitol 2005; 129(3–4): 243–51. Tesh RB. Control of zoonotic visceral leishmaniasis: Is it time to change strategies? Am J Trop Med Hyg 1995; 52(3): 287–92. Reiner SL, Locksley RM. The regulation of immunity to Leishmania major. Annu Rev Immunol 1995; 13(1): 151–77. Mohebali M, Edrissian GH, Nadim A, Hajjaran H, Akhoundi B, Hooshmand B, et al. Application of direct agglutination test (DAT) for the diagnosis and seroepidemiological studies of visceral leishmaniasis in Iran. Iran J Parasitol 2006; 1(1): 15–25. Gavgani AS, Mohite H, Edrissian GH, Mohebali M, Davies CR. Domestic dog ownership in Iran is a risk factor for human infection with Leishmania infantum. Am J Trop Med Hyg 2002; 67(5): 511–5. Hamidi AN, Nadim A, Edrissian GH, Tahvildar-Bidruni GH, Javadian E. Visceral leishmaniasis of jackals and dogs in northern Iran. Trans R Soc Trop Med Hyg 1982; 76(6): 756–7. Bokai S, Mobedi I, Edrissian GH, Nadim A. Seroepidemiological study of canine visceral leishmaniasis in Meshkin-Shahr, northwest of Iran. Arch Inst RAZI 1998; 48–49: 41–6. Mohebali M, Hamzavi Y, Edrissian GH, Forouzani A. Seroepidemiological study of visceral leishmaniasis among humans and animal reservoirs in Bushehr province, Islamic Republic of Iran. East Mediterr Health J 2001; 7(6): 912–7. Sadeghi H, Arshi SH. The prevalence of serologic leishmaniasis in flock and domestic dogs of nomads in Ardebil province in 2002 by using DAT method. J Ardabil Uni Med 2003; 3(2): 25–40. Mohebali M, Khamesipour A, Mobedi I, Zarei Z, Hashemi-Fesharki R. Double-blind randomized efficacy field trial of alum precipitated autoclaved Leishmania major vaccine mixed with BCG against canine visceral leishmaniasis in Meshkin-Shahr district, IR Iran. Vaccine 2004; 22(29–30): 4097–100. Mohebali M, Taran M, Zarei Z. Rapid detection of Leishmania infantum infection in dogs: Comparative study using an immunochromatographic dipstick rk39 test and direct agglutination. Vet Parasitol 2004; 121(3–4): 239–45. Fakhar M, Mohebali M, Barani M. Identification of endemic focus of kala-azar and seroepidemiologcial study of visceral leishmania infection in human and canine in Qom province, Iran. Armaghane Danesh 2004; 9(1): 43–52. Mosallanejad B, Ranjbar SH, Moradi B. Seroepidemiological investigation of visceral leishmaniasis in local dogs of Garmsar. Vet Microbiol 2004; 3(2): 60–5. Mahami M, Moheb Ali M, Keshavarz H, Hajjaran H, Akhoondi B, Zarei Z, et al. A seroepidemiological survey of visceral leishmaniasis (kala-azar) in Germi district, Ardabil Province. Sjsph 2006; 4(1): 45–55. Zebardast N. The identification of canine, reservoirs of visceral leishmaniasis (VL) in Chaharmahal and Bakhteyari provinces of Iran. Iran J Parasitol 2005; 2(1): 35–45. Fakhar M, Motazedian MH, Asgari Q, Mohebali M, Mehrabani D. A new endemic focus of visceral leishmaniosis in southeren Iran. Armaghane Danesh 2006; 11(2): 103–13. Avizeh R, Mohebali M, Sheikholslami M. Seroepidemiological investigation of visceral leishmaniasis in dogs of Ahvaz district, Iran. Arch Razi Inst 2007; 62(1): 31–7. Rassi Y, Gassemi MM, Javadian E, Rafizadeh S, Motazedian H, Vatandoost H. Vectors and reservoirs of cutaneous leishmaniasis in Marvdasht district, southern Islamic Republic of Iran. Iranian J Arthropod-Borne Dis 2007; 1(2): 14–8. Taran M, Mohebali M, Modaresi MH, Mamishi S, Mahmoudi M, Mojarad M. Diagnosis of canine visceral leishmaniasis by ELISA using K39 subrecombinant antigen. Iran J Public Health 2007; 36(2): 1–6. Farzam M, Changizi E, Mohebali M, Akhoundi B, Salimi BM. Seroepidemiological survey of canine visceral leishmaniasis in Jahrom City, Fars province. Iran J Vet Res 2008; 4(3): 58–67. Moshfe A, Mohebali M, Edrissian G, Zarei Z, Akhoundi B, Kazemi B, et al. Seroepidemiological study on canine visceral leishmaniasis in Meshkin-Shahr district, Ardabil province, northwest of Iran during 2006–2007. Iran J Parasitol 2008; 3(3): 1–10. Khanmohammadi M, Fallah E, Rahbari S, Hesaraki S. Study of seroprevalence of visceral leishmaniasis in wild canines in Sarab region (East Azarbaijan province). J Vet Diagn Invest 2008; 4(4): 997–1005. Moshfe A, Mohebali M, Edrissian G, Zarei Z, Akhoundi B, Kazemi B, et al. Canine visceral leishmaniasis: Asymptomatic infected dogs as a source of L. infantum infection. Acta Trop 2009; 112(2): 101–5. Khanmohammadi M, Fallah E, Rahbari S, Sohrabi I, Farshchian M, Hamzavi F, et al. Study on seroprevalence of canine visceral leishmaniasis (CVL) in ownership dogs of Sarab, East Azerbaijan province, northwest of Iran with indirect immunofluorescence antibody test (IFAT) and its health importance in 2008–2009. Asian J Anim Vet Adv 2010; 9(1): 139–43. Salahi-Moghaddam A, Mohebali M, Moshfae A, Habibi M, Zarei Z. Ecological study and risk mapping of visceral leishmaniasis in an endemic area of Iran based on a geographical information systems approach. Geospat Health J 2010; 5(1): 71–7. Fakhar M, Rahmati B, Gohardehi S, Mohebali M, Akhoundi B, Sharif M, et al. Molecular and seroepidemiological survey of visceral leishmaniasis among humans and domestic dogs in Mazandaran province, north of Iran. Iran J Parasitol 2011; 6(4): 51. Fallah E, Farshchian M, Khanmohammadi M. Molecular and seroepidemiological study of Leishmania infantum infection among humans, dogs and wild canines from Azarshahr (new endemic focus), Iran. Afr J Microbial Res 2011; 5(10): 1237–42. Fallah E, Khanmohammadi M, Rahbari S, Farshchian M, Farajnia S, Hamzavi F, et al. Serological survey and comparison of two polymerase chain reaction (PCR) assays with enzymelinked immunosorbent assay (ELISA) for the diagnosis of canine visceral leishmaniasis in dogs. Afr J Biotechnol 2011; 10(4): 648–56. Fallah E, Khanmohammadi M. A case report of visceral leishmaniasis in red fox (Vulpes vulpes). Afr J Biotechnol 2011; 10(86): 19941–6. Sharifdini M, Mohebali ME, Keshavarz H, Hosseininejad M, Hajjaran H, Akhoundi B, et al. Neospora caninum and Leishmania infantum co-infection in domestic dogs (Canis familiaris) in Meshkin-Shahr district, northwestern Iran. Iran J Arthropod Borne Dis 2011; 5(2): 60–8. Mohammadi-Ghalehbin B, Hatam GR, Sarkari B, Mohebali M, Zarei Z, Jaberipour M, et al. A Leishmania infantum FML-ELISA for the detection of symptomatic and asymptomatic canine visceral leishmaniasis in an endemic area of Iran. Iran J Immunol 2011; 8(4): 244–50. Ansari H, Moshfe AA, Solhjoo K, Khodadadi P, Kalantari M, Afshoon E, et al. Characterization of visceral leishmaniasis in reservoir host (dogs) and determination of agent by PCR in Boyer-Ahmad district, Iran. Armaghane Danesh 2012; 16(6): 537–44. Mahmoudvand H, Mohebali M, Sharifi I, Keshavarz H, Hajjaran H, Akhoundi B, et al. Epidemiological aspects of visceral leishmaniasis in Baft district, Kerman province, southeast of Iran. Iran J Parasitol 2011; 6(1): 1–11. Fakhar M, Motazedian MH, Asgari Q, Kalantari M. Asymptomatic domestic dogs are carriers of Leishmania infantum: Possible reservoirs host for human visceral leishmaniasis in southern Iran. Comp Clin Path 2012; 21(5): 801–7. Hosseininejad M, Mohebali M, Hosseini F, Karimi S, Sharifzad S, Akhoundi B. Seroprevalence of canine visceral leishmaniasis in asymptomatic dogs in Iran. Iran J Vet Res 2012; 13(1): 54–7. Razzaghi Manesh M, Mahabadi S, Ghamesi A, Namjoo AR. Seroprevalence of canine visceral leishmaniasis in dogs at Ardestan district detected by PCR. Vet Res 2012; 5(2): 22–5. Aflatoonian MR, Akhtardanesh B, Sharifi I, Mostafavi M. Seroepidemiology of canine visceral leishmaniosis in Kerman City, 2011. J Kerman Uni Med 2012; 19(6): 531–9. Mohammadiha A, Haghighi A, Mohebali M, Mahdian R, Abadi AR, Zarei Z, et al. Canine visceral leishmaniasis: A comparative study of real-time PCR, conventional PCR, and direct agglutination on sera for the detection of Leishmania infantum infection. Vet Parasitol 2013; 192(1–3): 83–90. Moshfe A, Mohebali M, Afshoun E, Mousavizadeh A, Zarei Z, Abidi H, et al. Canine visceral leishmaniasis in Boyer Ahmad district, Kohgiluyeh and Boyer Ahmad province, southwest of Iran. Iran J Parasitol 2012; 7(4): 75–81. Heidarpour M, Pourtaghi M, Khoshnegah J. 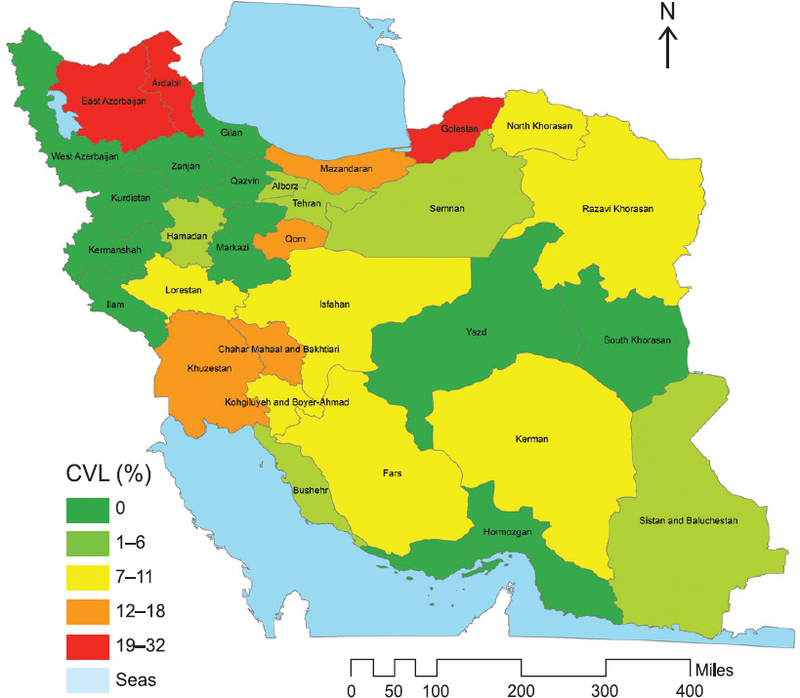 Prevalence and risk factors for canine leishmaniasis in Mashhad, northeast of Iran. Iran J Vet Tech 2012; 4(1): 37–46. Haddadzade HR, Fattahi R, Mohebali M, Akhoundi B, Ebrahimzade E. Seroepidemiologcal investigation of visceral leishmaniasis in stray and owned dogs in Alborz province, central Iran using direct agglutination test. Iran J Parasitol 2013; 8(1): 152–7. Hajjaran H, Mohebali M, Mamishi S, Vasigheh F, Oshaghi MA, Naddaf SR, et al. Molecular identification and polymorphism determination of cutaneous and visceral leishmaniasis agents isolated from human and animal hosts in Iran. Biomed Res Int 2013; 2013: 789326. Adinezadeh A, Eshrat Beigom KI, Mohebali M, Shojaee S, Rokni MB, Zarei Z, et al. Endoparasites of stray dogs in Mashhad, Khorasan-Razavi province, northeast Iran with special reference to zoonotic parasites. Iran J Parasitol 2013; 8(3): 459–66. Sabzevari S, Razmi GR, Naghibi A, Khoshnegah J. A serological study of Leishmania infantum in dogs of Khorasan Razavi province, Iran. J Parasit Dis 2013; 37(2): 189–91. Shabestari-Asl A, Sharifi M, Mohebali M, Zarei Z, Babaloo Z, Akhoundi B. Evaluation of canine anti-Leishmania IgG subclasses and their relation with skin signs in naturally infected dogs in the northwest of Iran. Turk J Vet Anim Sci 2013; 37(5): 512–5. Malmasi A, Janitabar S, Mohebali M, Akhoundi B, Maazi N, Aramoon M, et al. Seroepidemiologic survey of canine visceral leishmaniasis in Tehran and Alborz provinces of Iran. J Arthropod Borne Dis 2014; 8(2): 132–8. Mostafavi M, Baharak A, Iraj S, Sina K, Javad K, Mehdi B. Seroprevalence of canine visceral leishmaniasis in southeast of Iran. J Parasit Dis 2014; 38(2): 218–22. Fakhar M, Kia AA, Gohardehi S, Sharif M, Mohebali M, Akhoundi B, et al. Emergence of a new focus of visceral leishmaniasis due to Leishmania infantum in Golestan province, northeastern of Iran. J Parasit Dis 2014; 38(3): 255–9. Gharekhani J, Heidari H, Hajian-Bidar H, Abbasi-Doulatshahi E, Edalati-Shokat H. Prevalence of anti-Leishmania infantum antibodies in dogs from west of Iran. J Parasit Dis 2014; 40(3): 964–7. Fatollahzadeh M, Khanmohammadi M, Bazmani A, Mirsamadi N, Jafari R, Mohebali M, et al. Survey of feline visceral leishmaniasis in Azarshahr area, northwest of Iran, 2013. J Parasit Dis 2016; 40(3): 683–7. Namroodi S. Serological survey of Leishmania infantum in jackals in Golestan province, Iran (2011–2013). J Mazandaran Med 2015; 24(120): 25–9. Bamorovat M, Sharifi I, Mohammadi MA, Harandi MF, Mohebali M, Afshar RM, et al. Canine visceral leishmaniasis in Kerman, southeast of Iran: A seroepidemiological, histopathological and molecular study. Iran J Parasitol 2014; 9(3): 342. Bamorovat M, Sharifi I, Dabiri S, Mohammadi MA, Harandi MF, Mohebali M, et al. Leishmania tropica in stray dogs in southeast Iran. Iran J Public Health 2015; 44(10): 1359–66. Farahmand M, Khalaj V, Mohebali M, Khalili G, Naderi S, Ghaffarinejad P, et al. Comparison of recombinant A2-ELISA with rKE16 dipstick and direct agglutination tests for diagnosis of visceral leishmaniasis in dogs in northwestern Iran. Rev Soc Bras Med Trop 2015; 48(2): 188–93. Ghaffarinejad P, Farahmand M, Nahrevanian H, Mohebali M, Zaboli F, Zarei Z, et al. Diagnosis of Leishmania infantum using direct agglutination test and rKE16 dipstick rapid test in domestic dogs from Ardabil province, Iran. J Parasitol Res 2015; 10(3): 102–10. Barati M, Mohebali M, Alimohammadian MH, Khamesipour A, Akhoundi B, Zarei Z. Canine visceral leishmaniasis: Seroprevalence survey of asymptomatic dogs in an endemic area of northwestern Iran. J Parasit Dis 2015; 39(2): 221–4. Arainnejad M, Razmi G, Khoshnegah J. Molecular detection of canine leishmaniasis using conjunctival swab and buffy coat samples. Vet Clin Pathol 2016; 9(36): 275–84. Molaei S, Dalimi A, Mohamadi B, Akhondi B, Azarm A. Study of canine visceral leishmaniasis in symptomatic and asymptomatic domestic dogs in Meshkinshahr City, Iran. J Ardabil Med 2016; 16(1): 105–15. Jalilnavaz MR, Abai MR, Vatandoost H, Mohebali M, Akhavan AA, Zarei Z, et al. Application of flumethrin pour-on on reservoir dogs and its efficacy against sandflies in endemic focus of visceral leishmaniasis, Meshkinshahr, Iran. Iran J Arthropod Borne Dis 2016; 10(1): 78–86. Akhtardanesh B, Sharifi I, Mohammadi A, Mostafavi M, Hakimmipour M, Pourafshar NG. Feline visceral leishmaniasis in Kerman, southeast of Iran: Serological and molecular study. J Vector Borne Dis 2017; 54(1): 96–102. Nadim A, Navid-Hamidid A, Javadian E, Bidruni GT, Amini H. Present status of kala-azar in Iran. Am J Trop Med Hyg 1978; 27(1): 25–8. Moradi-Asl E, Mohebali M, Mohammadi-Ghalehbin B, Ganji A, Molaei S, Mehrivar R, et al. Study on changes in epidemiological patterns and parameters of visceral leishmaniasis in patients referred to health care centers of Meshkin Shahr during 2001–2012: A retrospective study. J Ardabil Med 2014; 14(1): 63–70. Moradi-Asl E, Hanafi-Bojd AA, Rassi Y, Vatandoost H, Mohebali M, Yaghoobi-Ershadi MR, et al. Situational analysis of visceral leishmaniasis in the most important endemic area of the disease in Iran. J Arthropod Borne Dis 2017; 11(4): 482–96. Moradi-Asl E, Rassi Y, Hanafi-Bojd AA, Vatandoost H, Saghafipour A, Adham Davoud, et al. The relationship between climatic factors and the prevalence of visceral leishmaniasis in northwest of Iran. Int J Pediatr 2018; 6(2): 7169–78. Oliveira FS, Pirmez C, Pires MQ, Brazil RP, Pacheco RS. PCR-based diagnosis for detection of Leishmania in skin and blood of rodents from an endemic area of cutaneous and visceral leishmaniasis in Brazil. Vet Parasitol 2005; 129(3–4): 219–27. Marcelino AP, Ferreira EC, Avendanha JS, Costa CF, Chiarelli D, Almeida G, et al. Molecular detection of Leishmania braziliensis in Rattus norvegicus in an area endemic for cutaneous leishmaniasis in Brazil. Vet Parasitol 2011; 183: 54–8. Gradoni L, Pozio E, Gramiccia M, Maroli M, Bettini S. Leishmaniasis in Tuscany (Italy): VII. Studies on the role of the black rat, Rattus rattus, in the epidemiology of visceral leishmaniasis. Trans R Soc Trop Med Hyg 1983; 77(4): 427–31. Ibrahim EA, al-Zahrani MA, al-Tuwaigri AS, al-Shammary FJ, Evans DA. Leishmania infecting man and wild animals in Saudi Arabia. 9. The black rat (Rattus rattus) a probable reservoir of visceral leishmaniasis in Gizan province, southwest Saudi Arabia. Trans R Soc Trop Med Hyg 1992; 86: 513–4. Zulueta AM, Villarroel E, Rodriguez N, Feliciangeli MD, Mazzarri MI, Reyes O, et al. Epidemiologic aspects of American visceral leishmaniasis in an endemic focus in eastern Venezuela. Trans R Soc Trop Med Hyg 1999; 61(6): 945–50. López-Céspedes A, Longoni SS, Sauri-Arceo CH, Sánchez-Moreno M, Rodríguez-Vivas RI, Escobedo-Ortegón FJ, et al. 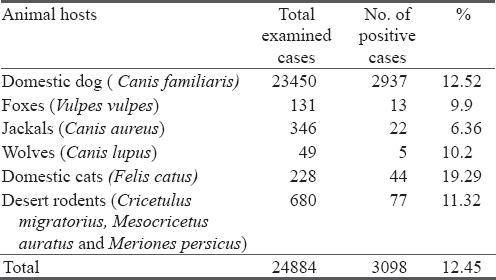 Leishmania spp epidemiology of canine leishmaniasis in the Yucatan Peninsula. Scientific World J 2012; 2012: 945871. Rosypal AC, Tidwell RR, Lindsay DS. Prevalence of antibodies to Leishmania infantum and Trypanosoma cruzi in wild canids from South Carolina. J Parasitol 2007; 93(4): 955–7. Jiménez M, González E, Martín-Martín I, Hernández S, Molina R. Could wild rabbits (Oryctolagus cuniculus) be reservoirs for Leishmania infantum in the focus of Madrid, Spain? Vet Parasitol 2014; 202(3–4): 296–300. Hatam GR, Adnani SJ, Asgari Q, Fallah E, Motazedian MH, Sadjjadi SM, et al. First report of natural infection in cats with Leishmania infantum in Iran. Vector Borne Zoonotic Dis 2010; 10(3): 313–6. Savani ES, de Oliveira Camargo MC, de Carvalho MR, Zampieri RA, dos Santos MG, D'Áuria SR, et al. The first record in the Americas of an autochthonous case of Leishmania (Leishmania) infantum chagasi in a domestic cat (Felix catus) from Cotia County, São Paulo State, Brazil. Vet Parasitol 2004; 120(3): 229–33. Mohebali M, Malmasi A, Khodabakhsh M, Zarei Z, Akhoundi B, Hajjaran H, et al. Feline leishmaniosis due to Leishmania infantum in northwest Iran: The role of cats in endemic areas of visceral leishmaniosis. Vet Parasitol 2017; 9: 13–6.